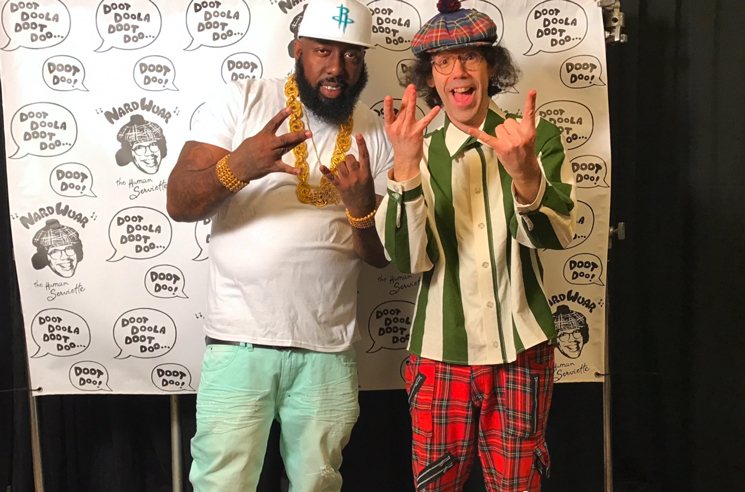 Intrepid Canadian music journalist Nardwuar the Human Serviette went in-depth on Houston hip-hop with Mike Dean last year, and at SXSW earlier this month, he expanded his knowledge base through interviewing Trae tha Truth. The two talk about Houston's deep hip-hop history, the lyricism of K Rino, the iconic Darrell "Wickett Crickett" Veal and how getting your music on a DJ Screw tape was worth more than getting radio play. Gifts for Trae included a cassette from Houston rap duo Street Military, a 12-inch from collaborator Spice 1, the deluxe edition of Lance Scott Walker and Peter Beste's book Houston Rap. Trae brings a gift for Nardwuar as well in the form of a gigantic boombox.